Karnataka TET Results 2018-2019 :Department Of School Education, Government Of Karnataka conducted the Teacher Eligibility Test on 3rd February across many places in Karnataka. Lakhs of hopefuls aspiring to become school teachers in Karnataka state have competed for the KTET examination. DSE Karnataka conducted the KAR TET Paper I and Paper II examinations on the same day. As per reports, the examination has been conducted in more than 500 examination centers across the state. DSE Karnataka released KTET Answer Keys after completion of the written test. The competitors who have come across the examination can download the answer keys from the official website, schooleducation.kar.nic.in. Candidates have to wait for a few more days to check the results. Soon, the DSE Karnataka will announce the result date. Keep checking the Karnataka School Education official website to check more updates. KTET Result 2019: Department Of School Education, Government Of Karnataka is going to conduct the Teacher Eligibility Test (TET) examination in the state of Karnataka. Candidates dreaming to become primary/secondary grade teachers in Government schools of Karnataka have to qualify the TET examination with requisite marks. DSE Karnataka annually releases the TET notification for interested aspirants wishing to become the teacher. This test is mandatory for getting a teaching job in government schools from class 1 to class 8. They are going to be 2 Papers in this exam. Paper 1 meant for teachers who are intended to teach for class 1 to class 5 and Paper 2 is for the teachers who are intended to teach for class 6 to class 8. DSE Karnataka accepted applications from eligible and interested candidates from 5th December to 25th December 2018. A large number of applicants have sent their online applications during the announced dates. In the state of Karnataka, the competitors who have clashed for the KAR TET examination and who are eager to check their Karnataka TET Result, scorecard, and merit list can wait for few more days to check the result. The Karnataka DSE will soon release the Karnataka TET Paper 1, Paper 2 results, the scorecard on its official portal, schooleducation.kar.nic.in. Candidates can also check the TET Paper I and II Cutoff marks/qualifying marks from the official website. The competitors can download Karnataka TET Result, scorecard 2019 for paper1 and Paper 2 individually. As per the latest update, the Karnataka Teacher Recruitment Board is expected to release the result in the 1st week of March 2019 (Tentatively). Aspirants have to get the minimum qualifying marks to get passed in the examination. Candidates can visit the TDSE official website, schooleducation.kar.nic.in to check the Karnataka TET cutoff marks for Paper 1 and Paper 2. KAR TET Paper 1, Paper 2 merit list with names of qualified candidates will also be published by the authority along with the results. Stay visiting the DSE Karnataka official portal on regular basis. 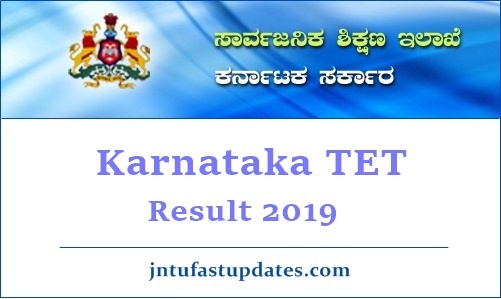 On the homepage Karnataka TET Results 2019 link appears; click on it. When results for tet exam? When they will publish TET result?